Most people running Oracle GoldenGate and want to monitor the processes with EM12c, will try to use the embedded JAgent. This JAgent will work with the OGG Plug-in 12.1.0.1. To get many of the new features and use the new plug-in (12.1.0.2), the new Oracle Monitor Agent (12.1.3.0) needs to be downloaded and installed. Finding the binaries for this is not that easy though. 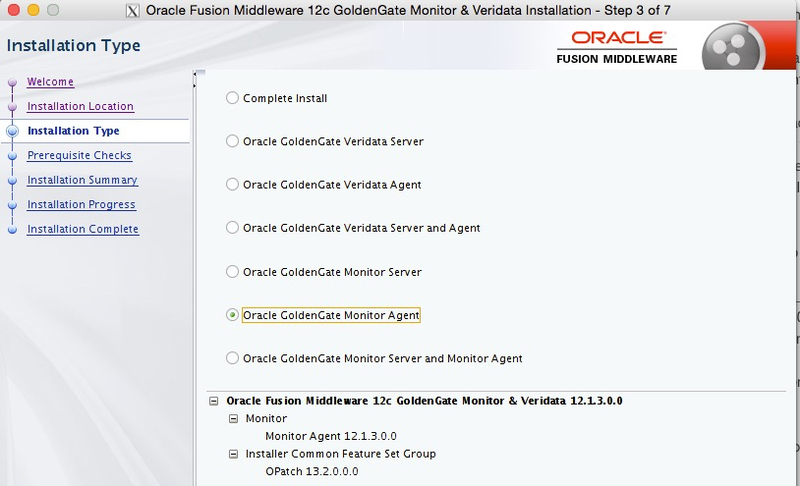 In order to get the binaires, download Oracle GoldenGate Monitor v12.1.3.0.0 from OTN.oracle.com. In order to install the agent, you need to have java 1.8 installed somewhere that can be used. The 12.1.3.0.0 software is built using JDK 1.8. After executing the command, the OUI installer will start. As you walk through the OUI, when the select page comes up; select the option to only install the Oracle GoldenGate Monitor Agent. The proceed through the rest of the OUI and complete the installation. After the installation is complete, then the JAgent needs to be configured. In order to do this, navigate to the directory where the binaries were installed. In this directory, look for a file called create_ogg_agent_instance.sh. This files has to be ran first to create the JAgent that will be associated with Oracle GoldenGate. In order to run this script, the $JAVA_HOME variable needs to be pointed to the JDK 1.8 location as well. Inputs that will need to be provided are the Oracle GoldenGate Home and where to install the JAgent (this is different from where the OUI installed). Sucessfully created OGG Agent instance. Next, go to the directory for the OGG Agent Instance (JAgent), then to the configuration (cfg) directory. In this directory, the Config.properities file needs to be edited. Just like with the old embedded JAgent, the same variables have to be changed. Then create the password that will be stored in the wallet directory under $OGG_HOME. Now, enable monitoring in the GLOBALS file in $OGG_HOME. After enabling monitoring, the JAgent should appear when doing an info all inside of GGSCI. Before starting the JAgent, create a datastore. What I’ve found works is to delete the datastore, restart GGSCI and create a new one. With the JAgent running, now configure Oracle Enterprise Manager 12c to use the JAgent. Note: In order to monitor Oracle GoldenGate with Oracle Enterprise Manager 12c, you need to deploy the Oracle GoldenGate Plug-in (12.1.0.2). Select the Host where the JAgent is running. Ensure the the Discovery Module for GoldenGate Discovery is enabled and then click the Edit Parameters to provided the username and rmx port specified in the Config.properties file. And provide the password was setup in the wallet. Then click OK.
At this point, force a discovery of any new targets that need to be monitored by using the Discover Now button. If the discovery was successful, the Oracle GoldenGate Manager process should be able to be seen and promoted for monitoring. After promoting the Oracle GoldenGate processes, they can then be seen in the Oracle GoldenGate Interface within Oracle Enterprise Manager 12c (Target -> GoldenGate). At this point, Oracle GoldenGate is being monitored by Oracle Enterprise Manager 12c. The new plug-in for Oracle GoldenGate is way better than the previous one; however, there still are a few thing that could be better. More on that later. Do you know why OEM could not discover a Replicat target? We have 3 replicat, only found 2. Your monitoring account/password may not be right. Also check the JAgent configuration there may be something off in config file.